Home » Food » History » Philippines » Pinoy brain » Pinoy Trivia » then deep fried? » What popular street food is a hard-boiled quail eggs dipped in a bright orange batter » What popular street food is a hard-boiled quail eggs dipped in a bright orange batter, then deep fried? 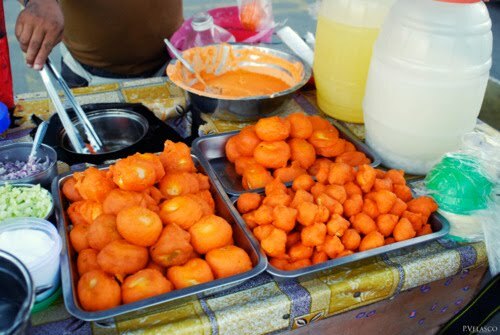 What popular street food is a hard-boiled quail eggs dipped in a bright orange batter, then deep fried? It is a hard-boiled quail eggs dipped in a bright orange batter, then deep fried. The batter is usually composed of flour, baking powder, some salt, and food coloring, allegedly once used to coat eggs that failed to sell the day before. (The day-old bit is pure speculation, not based on any historical account.) While the origins of the name and the dish have been lost, cholesterol-rich is arguably the tamest of the eggy treats you’ll find on the street. And its ilk are actually beloved after-school and after-work snacks—protein-and-carb pick-me-ups liberally sprinkled with salt and dipped in spicy vinegar.